LOS ANGELES – May 24, 2012 – The Los Angeles County Fire Department Lifeguard Division has been working closely with Hydronalix Corporation in evaluating a remote-controlled marine vehicle that lifeguards may use to aid potential struggling swimmers who may be caught in rip currents or other ocean hazards. The initial test craft has been dubbed “EMILY” in memory of 13-year-old Emily Rose Shane, who was tragically killed by a car while walking along Pacific Coast Highway in Malibu in 2010. Hydronalix President Tony Mulligan, decided to name his project after Shane, who was a close friend of his daughter’s, and was known for always wanting to help others, which is what this project is all about. 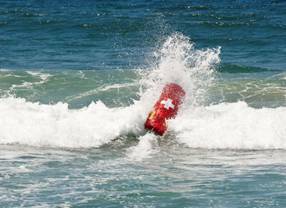 Hydronalix wisely approached the world-renowned Los Angeles County Lifeguards for input on the potential to use this technology for lifesaving purposes. “EMILY will never replace ocean lifeguards,” Mulligan commented, “but it may be able to get to drowning victims quickly enough to buy time until trained lifeguards arrive.” EMILY will need to be controlled by a qualified lifeguard who is trained to recognize hazardous ocean conditions, such as rip currents, in which swimmers may be inadvertently caught. EMILY may also have a future application in assisting in locating missing swimmers, as well as finding downed aircraft or sunken vessels. LOS ANGELES COUNTY LIFEGUARDS MADE 12,768 OCEAN RESCUES DURING THE LAST 12 MONTHS. When in doubt about any aspect of your beach experience, ask a lifeguard for direction. waterman:- Nice post. I read your post and also like it. you give information about NEW REMOTE-CONTROLLED MARINE VEHICLE NAMED “EMILY” is really helpful.